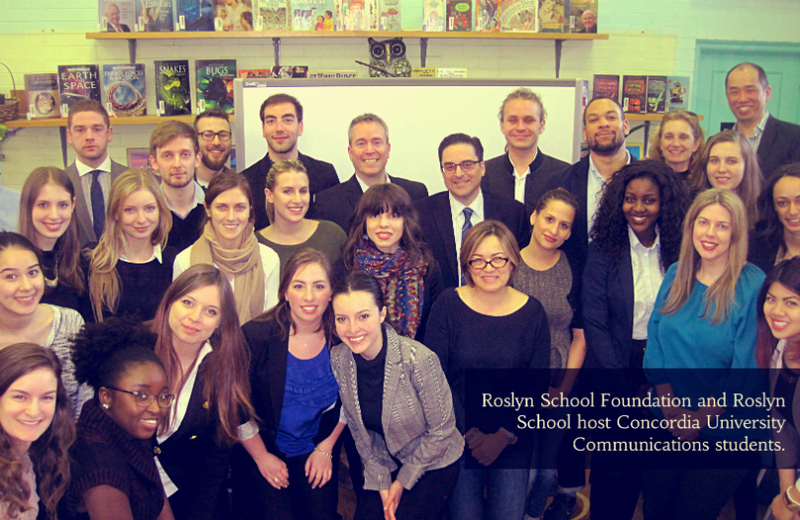 The Roslyn School Foundation hosted third year Concordia University students in the Communications course COMS 371 Public Relations: Principles and Problems on March 24. 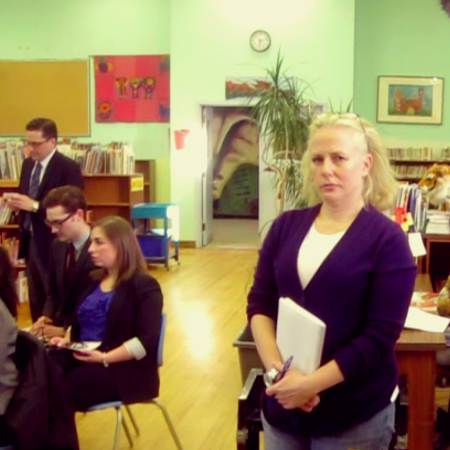 Course instructor Amy Creighton is a Roslyn parent, and through a suggestion from a Roslyn School Foundation supporter Amy offered to have her students use the Foundation’s 10th anniversary benefit event as a real life case study for her class. The community event was held in the Roslyn School library and featured the students' group projects recommending how the Foundation should celebrate and promote its 10th anniversary benefit event scheduled for Fall 2015. 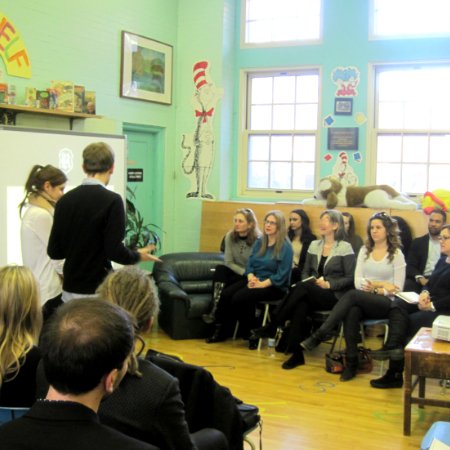 Seven groups presented their proposals to the Foundation's Board of Directors and Roslyn School guests. In attendance from Roslyn School Foundation were Paul Tsang (President), Irma Alvarez (Vice President), Jennifer Timmons (Secretary), Mélanie Dinis-Fernandez, and Honourary Members Jasmin Uhthoff (Founding member and first President) as well as Roslyn School principal Nicholas Katalifos. Special guests of the Foundation included Brian Weber, Roslyn Governing Board Chair, and Christine Cardinal, past Governing Board Chair and long standing supporter of Roslyn School. Amy Creighton's students displayed great energy, enthusiasm and strategic thinking in their recommendations to the Foundation. Paul Tsang commented, "for the majority of students, this project marks their first exposure to a not-for-profit organization, and the group quickly showed their understanding of the Foundation's challenges and opportunities. This project allowed the students to support our Foundation's efforts to generate awareness and fundraise on behalf of Roslyn. We hope the students stay in touch. We'll definitely invite them to help us celebrate our 10th Anniversary this Fall!" Refreshments were graciously donated by Roslyn parents and friends of the Foundation. The Board of Directors wishes to thank Amy Creighton and her students for their efforts to help the Foundation in its communications and event planning and to advance its mission. The Board hopes through this project there will be 30 plus new Roslyn School Foundation ambassadors!